Competition See WONDER PARK for the chance to WIN a YEARS' SUPPLY OF TOP JUICE! 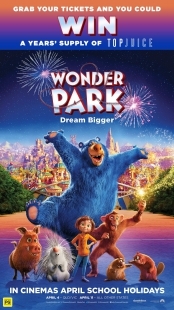 See WONDER PARK for the chance to WIN a YEARS' SUPPLY OF TOP JUICE! Let your imagination run wild with WONDER PARK and you could WIN a YEARS' SUPPLY of TOP JUICE! *Remember to hold onto your tickets in case you are the winner! Describe your ideal amusement park.